This is a little painting I did inspired by some old photos I found. Like with "Barnyard Bully Boy", I didn't believe that the setting in which I captured this great blue heron showed him to his best advantage. So, I pictured him, as I would have preferred to see him: purposely strutting along the edge of a body of turquoise water whose hue would make his warm body visually pop against the background. I've always loved these large birds. They remind me of officious clerks in a Dickens novel -- looking purposefully elegant, but sometimes behaving in the most ridiculous ways. I can vividly remember one time that I and a large crowd were captured by the site of a great blue who seemed intent on suicide by fish. He was in the process of trying to swallow a huge fish he had just speared. It was much wider than his neck. He tossed it up in the air, expecting it to slip right down his gullet. Unsurprisingly, it stuck like a cork in a bottle. But, our blue was not deterred from his task. He spent at least a quarter hour trying to swallow that behemoth -- seeming to almost kill himself in the process. In the end, all the bird's inelegant gyrating did have a good effect. He downed the fish and lived. We all cheered. I hope you enjoy this picture of his brethren as much as I liked painting it. 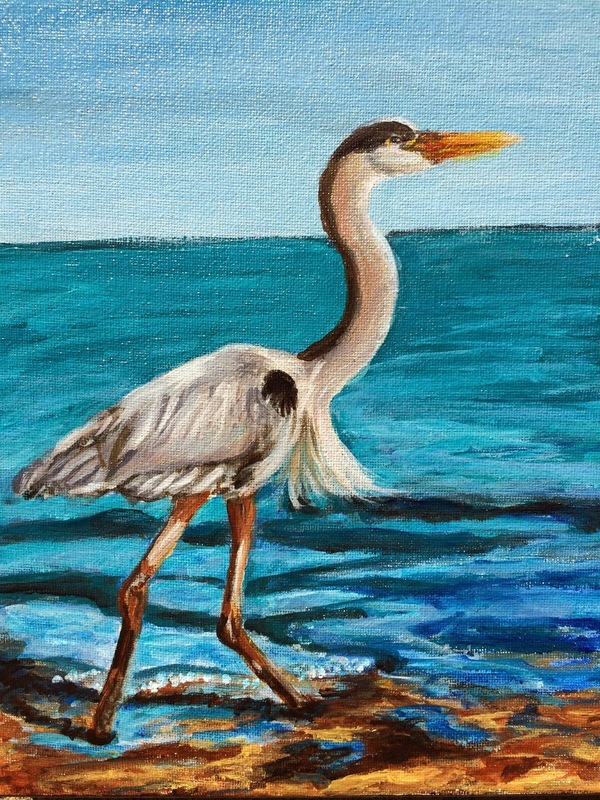 As with all the small paintings on this blog, if you are interested in buying Strutting His Stuff, You can bid on him on my Daily Paintworks gallery and auction site, or buy him directly on the site. I hope you enjoy and would welcome any comments.